Today I would like to ask you to participate in 1st Annual Run for Birtukan. Whether you choose to walk, run, this event is a great way to get some exercise in support of free Birtukan and all Prisoners of Conscience in Ethiopia. Birtukan Mideksa, an Ethiopian prisoner of conscience who is facing life imprisonment for speaking out against an oppressive government. Birtukan is an opposition leader of the Unity for Democracy and Justice (formerly Coalition for Unity and Democracy) party and is advocating for democracy and rule of law in Ethiopia. Birtukan has a five year old daughter, Hale Mideksa, in the care of her ailing seventy-five year old mother as she languishes in jail at this very moment. Our organization Solidarity Movement for a New Ethiopia and our task force, Global Campaign and Advocacy Task Force support the Ethiopian Human Rights Committee’s run on September 19, 2010 in Tuebingen, Germany to free Birtukan and other prisoners of conscience in Ethiopia. Let’s make this day to be gratitude of the daily fight that Birtukan faces in a secluded cell. Ms Birtukan Mideksa is unarguably the most prominent female political leader in Africa and currently the head of the biggest opposition party in Ethiopia, a single mother, a prisoner of conscience, and the hope of eighty (80) million Ethiopians. All of this at the very old age of 35. Birtukan first came to the unwanted attention of the Ethiopian government in her late twenties when she was serving as a judge in Addis Ababa. She famously ruled to release a former Defense Minister of Ethiopia who was in prison for political reasons. In a country where the government routinely intimidates, imprisons, and even murders dissenters, Ms Mideksa brushed aside intimidation and pressure to follow her conscience. When the government ignored her ruling and subsequently and illegally imprisoned the defendant, Ms Mideksa left (systematically fired) her post and joined an opposition political party in order to correct the abuses in the legal system. She led this opposition party to win the now infamous and subsequently stolen elections of 2005. Why is Birtukan in Prison now? 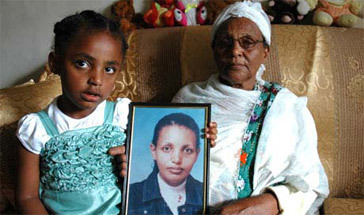 Birtukan was arrested for the second time on December 29, 2008 and sentenced to life in prison because of a speech she gave in Sweden about the condition of her first illegal incarceration. Yes, Birtukan is now in prison because of a speech. Birtukan was illegally imprisoned for the first time following the disputed 2005 elections. Along with more “than 200 opposition party leaders”, she spent close to two years in prison under the threat of torture and was only released because of international pressure that lead to a politically negotiated settlement with the government. The trumped up charges at that time were treason and genocide. Now, she is back in prison under the threat of torture because she spoke about the conditions of her incarceration and the circumstances surrounding her release. This unjust, cruel, and inhumane action is meant to intimidate and silence the public as much as to cripple the opposition. Ethiopian prisons have killed thousands of prisoners of conscience through torture, disease, abuse, and the systemic denial of medical care. Let's stand united behind Birtukan and thousands of other prisoners of conscience like her. Regardless of what you believe in, I know that you know any human being should have the right to exercise and stand up for whatever political view he/she has. Even if you differ with her positions, I plead with you to acknowledge that she is an image of our unified freedoms and human rights. Open your mind and heart to help Birtukan to obtain her freedom and allow her to be with her elderly mom and Hale and leads us to this new and free Ethiopia we all be equal and to live freely. I am asking everyone to support and remember Birtukan on September 19, 2010 by taking a part in the Run for Birtukan.